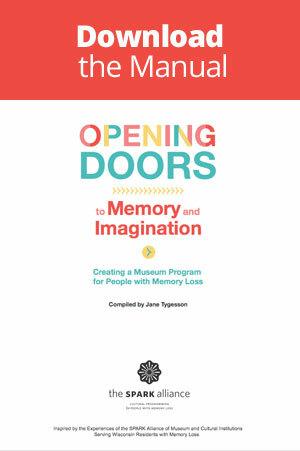 Opening Doors to Memory and Imagination: Creating a Museum Program for People with Memory Loss is a 97-page manual available free of charge. Compiled by Jane Tygesson, it offers museums and cultural institutions a road map for launching programs for adults with memory loss. Small, large, rural, urban — any museum or cultural institution can open their doors to serve those with memory loss and their caregivers. Sample tour topics, communication tips, promotional materials, and evaluation tools. The manual is free to download, made possible through a partnership with the SPARK Alliance and funding from the Helen Bader Foundation.